I love the colors. Everything is so vivid here. The colors, the shading, the motion. Everything about this is perfect. Amazing work! Nice, though it looks like it's based on Hartman's "correction", which tuned out to be wrong. However, Andrea Cau's version is quite likely. never heared of sigilmassasaurus but i assume its the mini spino there? But is there an exact size of Sigilmassasaurus ? No site seemed to has one. I am sorry I was first read the Sigilmassa could be up to 12m from first news that make it a genunie taxon. 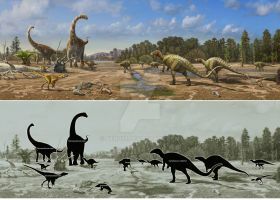 I really like how not cluttered your multi-species paleoart pieces are. Also, I really like the color schemes of these spinosaurs. Love the color work on Spiny's sail. Personally, I'm waiting before drawing Spinosaurus till there are some clarification, but the artistic research here is very good. I like how you added all that fauna and flora, and the general composition of the piece. What size did you use for Sigilmassasaurus? I've seen so many variations of it near Baryonyx size, and even near Spinosaurus' size? Great art dude! 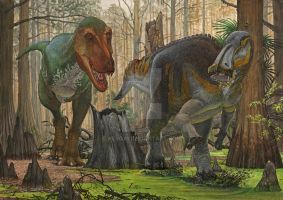 The only uncovered specimen was about Baryonyx sized; some people say that it was a juvenile and an adult could be closer to Suchomimus/T.rex-sized. 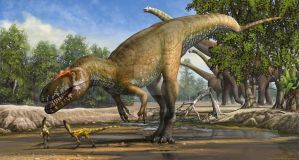 Spinosauroids definetly don't stay Small aren't they ? Do you have a website? How would someone buy a print of some of your work? 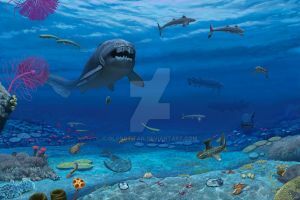 I spy with my little eye, a sneaky little Rugops and Sauroniops! 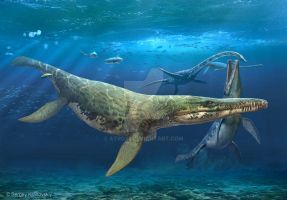 But still, it would make more sense if it were Sauroniops because it was one of the giant carcharodontosaurids that mainly inhabited the Kem Kem Beds in Morocco. I see Carcharodontosaurus being more common in Egypt. So Carcharo has a longer and narrower skull than Sauron? I know. Is that like another species or subspecies of Carcharodontosaurus? Amazingly talented work ! Thanks so much for drawing this too ! And we have a new gigantic spinosauroid in addition to bipedal spinosaurus; who can ask more ? Too bad it's legs were really too short for true bipedal locomotion. Finally someone who made Spinosaurus what I imagined it too look like! 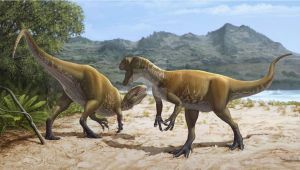 I believe the case of those two spinosaurids is similiar to the one in Brazil, with irritator and angaturama. Love it! Well this is my screen saver from now on! And despite all the controversy it could raise, let's appreciate your work of art as it is. It is beautiful in every aspect. From the excellent compositing that feels more natural and looks less artificial than other artists's work and the compelling composition, with multiple layers and centers of activity, along with a great selection of small to big animals. My only nitpick would be the Sigilmassasaurus's arms which looks a bit long to me. But we don't have remains of the arms so it's still plausible. ^^ In short, a really fantastic work on its own and a great illustration for the new study, wether we agree or not with all their conclusions.